I can’t get enough of this new tradition. 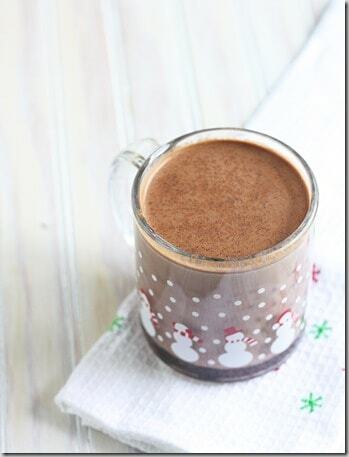 I love the spices in this hot chocolate and I love how good it tastes without a lot of sugar. In face, I usually cut the honey to about a half of cup. This recipe from Cooking Light is a great addition the holiday drink lineup. Combine first 6 ingredients in a large, heavy saucepan. Bring to a boil over medium-high heat, stirring constantly. Gradually add milk and extract, stirring constantly with a whisk. Heat to 180° or until tiny bubbles form around edge, stirring with a whisk (do not boil).